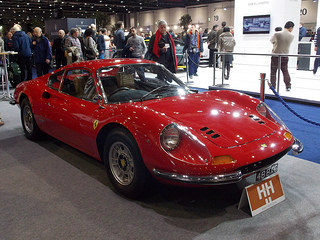 The Ferrari Dino 206 GT sports car had a short production run of just one year, in which only 152 units were built. However, although the market was impressed with the styling of the car, there was a call for a version with more performance. 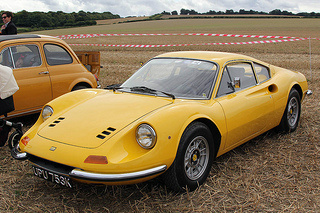 Consequently, in 1969, the two seater, Ferrari Dino 246 fixed head coupe was introduced at the Turin Motor Show. Furthermore, in 1972 at the Geneva Motor Show, the open top Dino 246 GTS Spyder was added, which featured a removable Targa top. Once again, Pininfarina was responsible for the car's styling. Also, as was the case with the 206 GT, the engines were built by Fiat, and the car was assembled at the Ferrari plant in Maranello. The "246" weighed 2380 lbs, compared with the 1980 lbs of the "206", and this was due, in part, to the fact that the body panels of the latter were made of aluminium, whilst those of the former were now constructed of steel, in order to reduce cost. Also, the wheelbase of the "246" was increased by a further 2.1 inches compared with that of the "206", although the height remained the same. Vacuum assisted four wheel vented disc brakes, and all round coil spring independent suspension were retained from the "206". 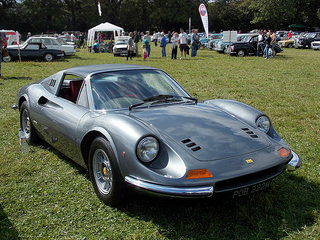 By the time production ended in 1974, a total of 2295 units of the Ferrari Dino 246 GT sports car had been built. 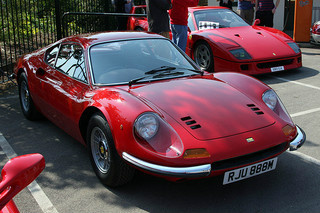 Optional extras included flared wheel arches, and seats sourced from the 365 GTB/4 Daytona. A close competitor of the 246 GT sports car was, at that time, the 2.4 litre Porsche 911S Targa, which was regarded as a touchstone in terms of performance. The transverse mid-engined Ferrari Dino 246 GT was powered by a 2.4 litre, twin overhead cam V6 unit, with two valves per cyliinder, using an iron block and alloy heads, and with a compression ratio of 9.0:1. Fitted with a five speed manual gearbox, three twin choke Weber 40 DCNF/6 carburettors, and electronic ignition, it developed 195 bhp at 7600 rpm, and 166 ft/lbs of torque at 5500 rpm. This produced a top speed of 151 mph, and a 0-60 mph time of 7.5 secs. However, the version exported to the US underwent certain changes, including the timing, which reduced the output to 175 bhp. A noteworthy point was that the Dino's 2.4 litre V6 engine was subsequently used in other Italian sports cars, and in particular the Lancia Stratos. 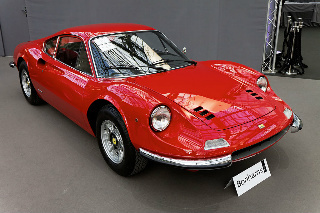 In terms of the second hand market, a Ferrari Dino 246 GT, in good condition, was sold at auction in the US for $165,000, whilst one in showroom condition fetched a staggering $630,000 at auction. 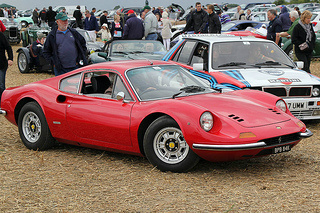 The Dino was an excellent example of one of the classic cars from Ferrari.